Electric cars: will shopping centres lead the charge? Electric vehicles (EV) have been around for a long time. But now at last they are starting to become a serious contender for choice as the family car. It’s projected that within the next 20 years or so, EV will make up some 27% of car sales, or about 270,000 vehicles per year. That’s 2.8 million EVs on the road by 2036. So where will all these electric cars charge up? Obviously, a lot will do so at home – and that will place a heavy load on electricity providers. At PRF, we predict that a lot of EV owners will be opting for solar energy at home, to take advantage of free electricity from the sun, and relieve the load on poor old Western Power. And we think owners will be looking for opportunities to top-up their charge at places where they leave their cars for periods of over an hour or more. That means car parks, especially shopping centre car parks. 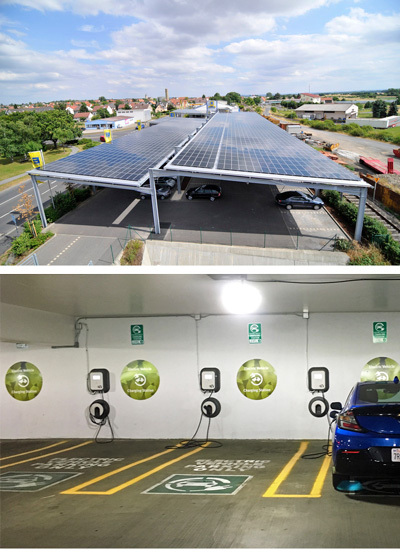 The shopping centre car park of the future – solar cells combine shade with electricity production. We can easily imagine a future in which shopping centre owners build car park shades out of photovoltaic (PV) cells that collect free energy from the sun, and channel that electricity into EV chargers for Australia’s growing fleet of electric car owners. Owners will of course be charged (pardon the pun) for the privilege of topping up using the centre’s charging station, but many will be all too willing to do so. All it needs is a shopping centre owner with the vision and foresight to take advantage of the coming electrical storm. It will happen – but who will be the first?